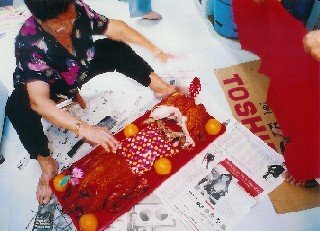 For cantonese, it is most important to have a roast pig complete with tail and ears as part of the gifts for the bride’s home visit. 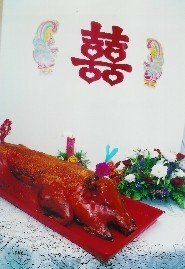 Pig [猪] in cantonese "ju" sounds the same as [宫纱珠] "kong sa ju", the chinese legendary sign of virginity. The [宫纱珠] "kong sa ju", a red dot placed on a girl's forearm as a virgin, was said to disappear when she lost her chastity. If the groom was satisfied that his wife was married as a virgin, a gift of roast pig complete with tail would accompany the bride's home visit. If not, the roast pig's tail or ears were broke off. Keep the whole roast pig? The bride's family will only retain the middle portion of the roast pig. Included in the return gifts are clothing and a belt for the groom. The gifts are wrapped in plastic and placed between the head and tail of the roast pig. A piece of red paper is then wrapped around these. Removing the middle portion from a roast pig neatly is not easy. There are metal frames supporting the underbelly of the roast pig to retain its shape. It is not easy to disassemble these to cut the pork. So the bride’s parents must ensure that someone is able to cut the roast pig for the return gift. The bride's family may distribute the roast pork to their close relatives or serve the meat at the chinese wedding banquet to their guest. 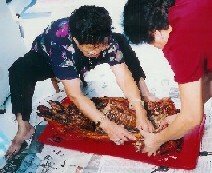 Remember to reconfirm the order for the roast pig a few days before the chinese wedding day to ensure that it will be available for the bride’s home visit.